Wow! Incredibly complex and floral. Below is a heavy oily sweetness, coconut, vanilla and burned grass, cedar and slightly burnt toast with orange marmalade. In the body surprisingly light but very lively. Again very floral, dry, fragrant hay, or better hay harvest in midsummer with all the aromas of hay, oily elements and warm earth. Later also liquorice and subtle smoke. Very long, nutty and burnt grass again. Extraordinary stuff. One of the best I've tried. This whisky gives you so many associations that are all pleasant, that you could easily linger for hours with a dram. There is a lot going on here. It's complex and utterly powerful. There is a nice combination of wood smoke, beeswax, sweet malt, lavender honey, rose, citrus, and peach. After a while, aromas of vanilla and creamy banana custard unfold. Long, creamy, and very fruity. Think of a tropical fruit milkshake, icing sugar, and the like. Then, still the wonderful malt, cinnamon, and pepper. Gentle and really sweet. Well balanced. Its flits between the fruit,drier cereal elements and acidity, making this a complete and complex package. Rounded and umami-like . Wonderful. Fresh and acidic. Long aftertaste. Lovely. What a powerful whisky! It's one of the very few whiskys I really need to add water. Otherwise it is great! Wow, really powerful. Lots of lemons and citrus fruits, oily and liquorice, salty and peppery. Pretty dry. Need to add water. More water. Now becomes much smoother. I start tasting wood notes and a subtle sweetness appears. 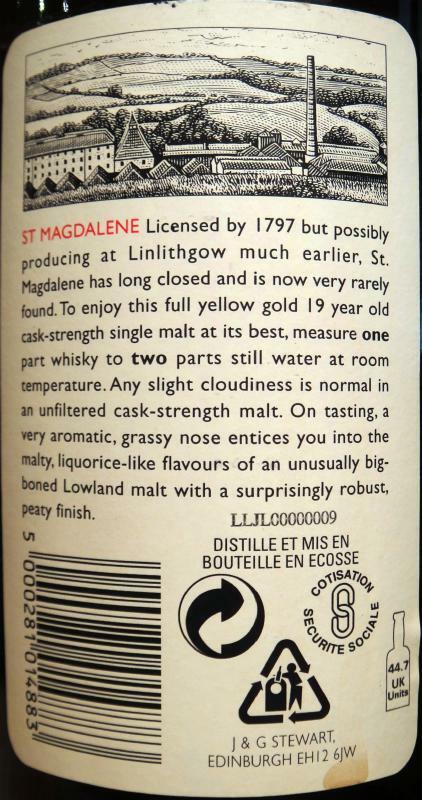 Long and burning - a tad bitter in the end and more vegetal but that's OK.
(twe) St Magdalene's 1979 entry in the Rare Malts series. 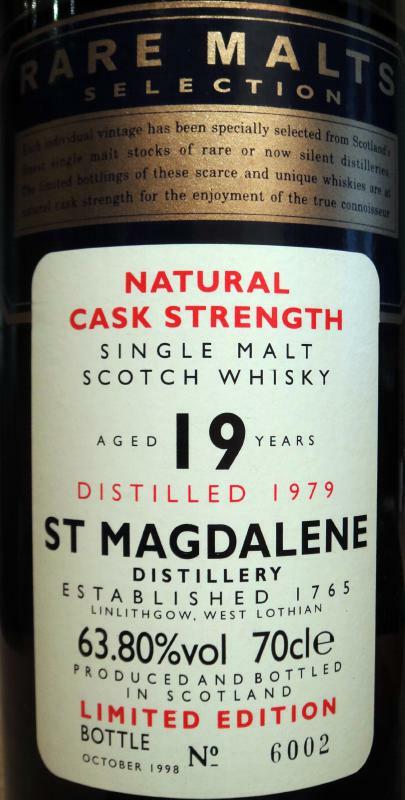 The distillery closed in 1983, as part of the mass-closures across the industry at the time, and this is one of the few official bottlings that made it out of the distillery. It's an excellent malt, picking up a stack of 90+ scores from the Malt Maniacs. I could try it these days and I must say this is one of the BEST Whiskies I´ve ever had! If you can get to this, don´t think to long... it is worth every cent!!! Well, This is Epic, but it`s not easy, you have to work for it. You will be rewarded with layers and layers of fantastic aroma`s. Give it a lot of time. I don`t use it a lot, but this one is best in a very big Cognac snifter! Try it. Very strong in alcohol as often with rare malts. Beautiful complexity. But we feel that we are at the opening of the bottle and that the potential is not yet exploited. To eat. Nose sting a little bit. On the palate it is balanced on the woody and aromas typical of bourbon. Long finish on pepper, leather, tobacco, yellow fruit. Ralfy review 764: https://www.youtube.com/watch?v=5WI8VdukXjA (97/100). 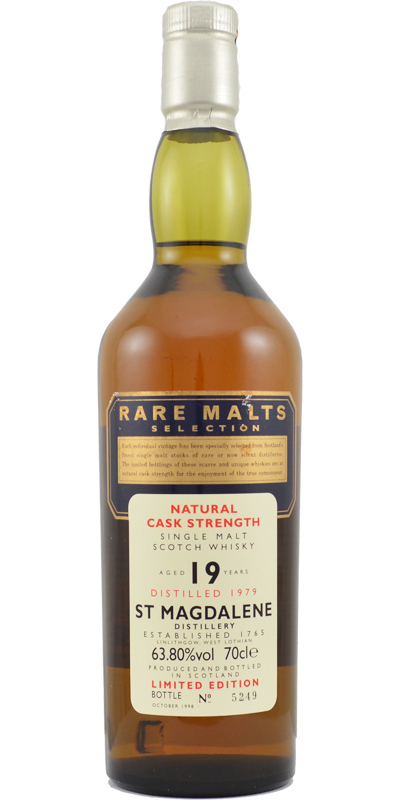 "Bigger, more matured than many malts twice its age."